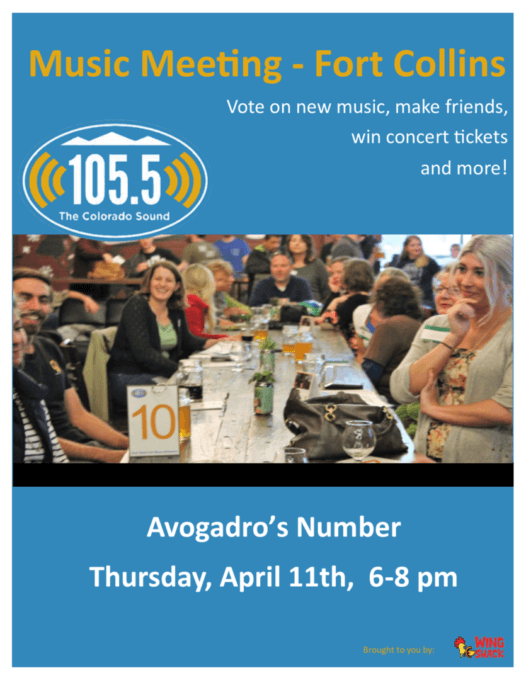 On Thursday, April 11 beginning at 6 pm, we’ll be headed to Fort Collins’ Avogadro’s Number for our newest Music Meeting. These events bring us all together to vote on new music (much of it unreleased and unheard until our events) to help us fill out playlists. Consider it a community gathering of the best order! To attend the event, please RSVP here. These events fill quickly. Avogadro’s Number is located at 605 South Mason St., in Fort Collins. You can find a playlist from our last Music Meeting. In Fort Collins, we’ll have several new and unreleased tracks for you to vote on. We’re looking forward to seeing you out there! You guys are the best! I listen this station every day and have discovered some amazing bands over the last couple years. Thank you!